Perspective marked cards and perspective invisible ink contact lenses are your best partner in the game. Any brand of normal playing cards are marked with perspective invisible ink, which can help you understand all the hands of your opponents. Modiano Napoletane playing cards are plasticate playing cards, because their professional quality, are popular with the casinos over the world. Modiano plasticate Napoletane playing cards marked with the invisible ink can be your ideal choice for any game. 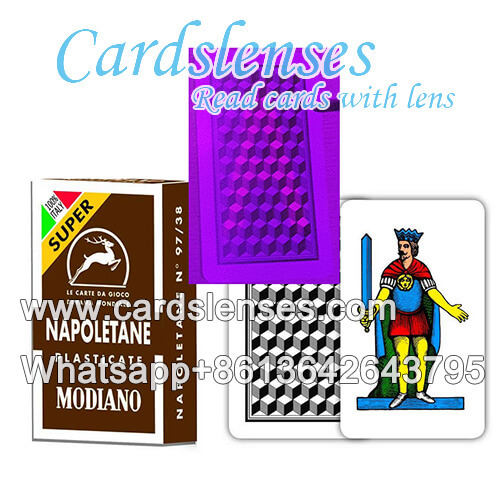 Modiano Napoletane playing cards are origin from Italy, can be marked for contact lenses, poker scanner and analyzer. And the invisible ink marks can be customized.